VBA code to open text file will help you to read the text file data. VBA open text file example will show you how to open a text file using FileSystem Object. 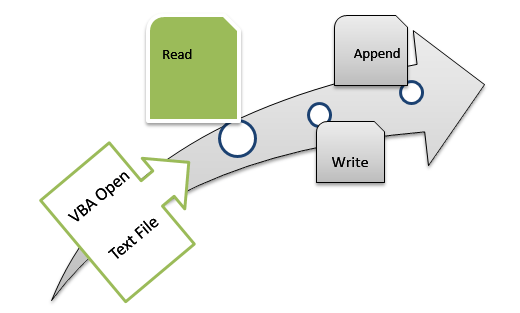 We can open the Text File for Reading the data, Appending the data and writing the data. Following is the VBA syntax and VBA example to open a file using File system object in VBA. Here is the VBA code and syntax to open the text file using VBA Fiel System Object. Here we need to pass the text file path to open using VBA. Following is the example VBA code to open the text file suing VBA. Here we need to add reference to ‘Microsoft Scripting Runtime library‘ to use the FSO library in our code. First we are creting the FileSystem Object and opening the text file. Then we are reading the each line in the text file until end of the File. I was trying to use the code provided by you, to open the outlook signature text(.txt) file from the signature folder. I am passing the arguments, path and readmode to OpenTextFile but when I try to extract the contents into string it is not taking the values in the file but is showing me some junk. Please try to open the text file using ADO , it should solve your issue.